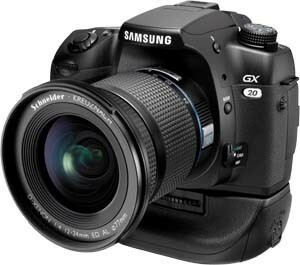 Samsung’s research and development team is considering bringing the Android operating system to digital cameras. The topic was discussed with Engadget during their visit to the Korean headquarters this week, although the company says the idea is still in early stages and nothing is confirmed. The idea makes a lot of sense and it’s something I’ve personally wondered why we haven’t seen already. Android would allow third-party developers to make apps for cameras that would let shooters publish photos directly to social media networks like Twitter, Facebook and Google+ or photo sharing sites such as Flickr, Photobucket and Picasa. A touch screen interface would allow users to label or comment on photos before beaming them online. Users could connect a 4G modem using the hot shoe or USB port. Or better yet, cameras could include the modem internally – all of which could work out great should wireless providers eventually move to shared data plans. Companies like Eye-Fi have been offering Wi-Fi SD cards for some time, allowing their customers to wirelessly transfer pictures from a camera to a compatible device such as a computer, notebook, tablet or smartphone. But having a similar feature built into a camera and transfer over 4G would eliminate the “middle man” so to speak. But, wouldn’t this essentially do the same thing as today’s smartphones, minus all of the other features? Yes, but a real digital camera would allow for pictures that are far superior to what even the best mobile phone shooters are currently capable of. After all, have you seen some of the terrible pictures that people upload to Facebook from their phone? The Engadget piece notes that OS stability could become an issue and that you might need to reboot your camera just as often as your smartphone. I don’t particularly agree with this statement because, unlike a phone that remains in standby, a camera is always off unless it’s being used. Boot-up time, on the other hand, could be a potential stumbling block. Whether it’s Android or another mobile OS, here’s to hoping we eventually see true digital cameras with wireless capabilities at some point in the near future.